Much has been said about old-school games in the last fifteen years, and sometimes it may look like the gaming landscape of the late 1970s and early 1980s has been explored to exhaustion. This notion is a comforting illusion, as this exploration only covers a handful of well-known works that enjoyed relatively wide distribution. Meanwhile, a lot of material suffered from the limitations of small press publishing, and we know even less about game texts from personal campaigns – meant for table use, and never written up for publication. What we do know (through efforts like Plagmada) focuses more on the 1980s, when D&D was becoming a household name. Beyond bits and pieces of the Greyhawk campaign, our main sources for the 1970s are the early Judges Guild materials, The First Fantasy Campaign, The Dungeoneer (a repository of materials by Paul Jaquays’ circle), and a few odd extras like the great Ryth Chronicle. 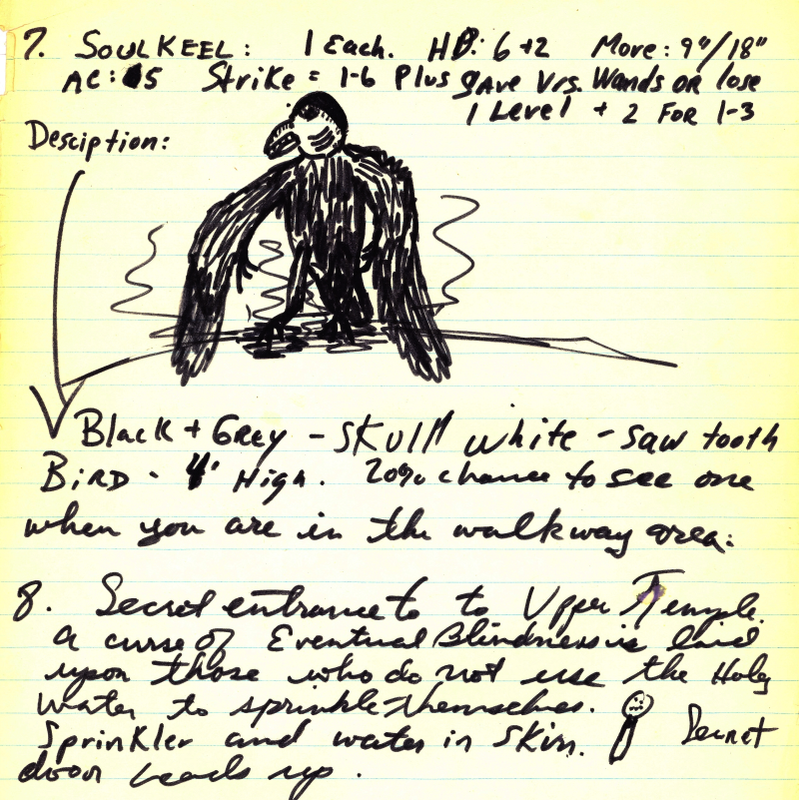 These – particularly the FFC, a published archive of Dave Arneson’s Blackmoor notes – are always a fascinating read, with a lot of off-the-wall ideas developed before D&D became standardised. Beyond a historical interest, it is this exploration of D&D’s untapped potential which makes them so interesting to today’s gamers. In addition to an interest in old adventures, it is mostly this curiosity which informed my review of the El Raja Key Archive. The archive, available in three different editions of increasing price and exclusivity, is a minor-league collector item in its own right, and it is priced and presented as such. You can get the crippleware Basic edition, or you can fork over $160 for the signed and numbered Collector’s edition, with an ultra-special version of Sunken City that has an extra adventure area and blue instead of green cover. In between are two more options. In the end, though, all editions above Basic contain the same core content: high-resolution scans of campaign materials with accompanying designer notes, launched from a simple HTML-based shell programme. The materials are structured around campaigns (pre-D&D, Blackmoor, the original Greyhawk campaign, Rob’s own World of Kalibruhn, Tékumel, and some miscellena), all of them meticulously cross-indexed. 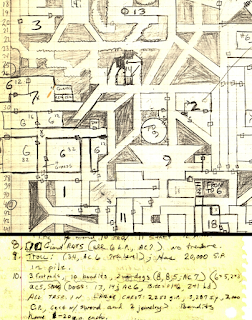 The bulk of documents come from Greyhawk and Kalibruhn, although there are three unreleased adventure fragments from the 1980s, as well as two Tékumel maps and a few small documents from the transition period between Chainmail and D&D. The scans are detailed, although they were often taken at high brightness levels, and benefit from corrections with some image manipulation programme (all images in this review have had their brightness adjusted for legibility). The explanatory notes that come with the scanned materials are much less exhaustive than one might suspect, and to me, they represent a major missed opportunity. It turns out the notes are taken (mostly?) verbatim from the eBay auctions where these materials were originally sold off in 2006, and are essentially sales pitches. We get a lot of oohs, ahs and wows about Rob’s peculiar genius, or which Original Gamers™ adventured in them (meticulously cross-indexed! ), but when it comes to actually shedding light on what was in these partially recovered treasures, our information often amounts to a short paragraph or so. It is something, and at least the adventures are put into the context of their campaigns and (Rob being Rob) extensive publication histories that could have been, but you still come away with the feeling you have just paid for ad copy. What’s more, if you followed those 2006 auctions, you have already read most of it. As a small compensation, Rob’s Up on a Soapbox articles from Dragon Magazine are also tucked away in a dusty corner of the archive, several levels deep. The Greyhawk and Kalibruhn documents that take up most of the advertised “over 1000 images” vary enormously in scope and quality. There are a lot of them, but most are very far from complete (as in presenting complete and play-ready information). A lot of them survive only as unkeyed maps, or very sparse and minimal notes. This is the case of Castle El Raja Key and the expanded Greyhawk Castle, the two largely overlapping megadungeons which represent the archive’s most obvious selling point. 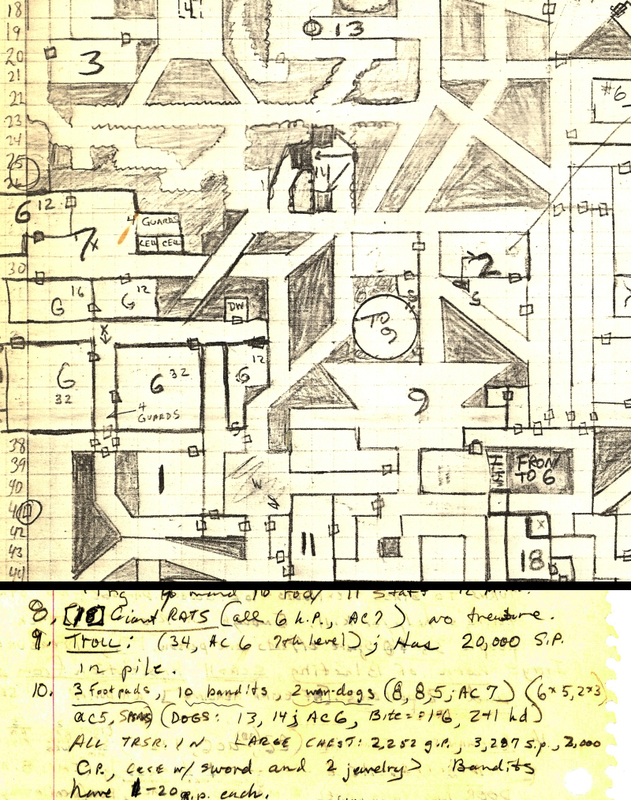 The 13 levels and sublevels of El Raja Key, and the 17 of Greyhawk offer interesting exercises of mapmaking, showing a growth from rectangular room mazes to more formally interesting dungeon levels. Regrettably, much of the content which have made these levels interesting has been lost. This is partially a physical loss, since only ERK1, ERK2, ERK3, GH2 and GH2 Special (Bottle City) have surviving keys, a mere fraction of the full dungeon materials (most of which is held by Gail Gygax, who seems to have no interest in publishing them). But things are also lost because the keys say so little. Both Rob and Gary tended to keep things in their head, only bothering to keep the most simple notes. For the most part, the room keys are monster lairs, with the occasional tactical note and trick – these are rather clever, and I wish there was more of them. 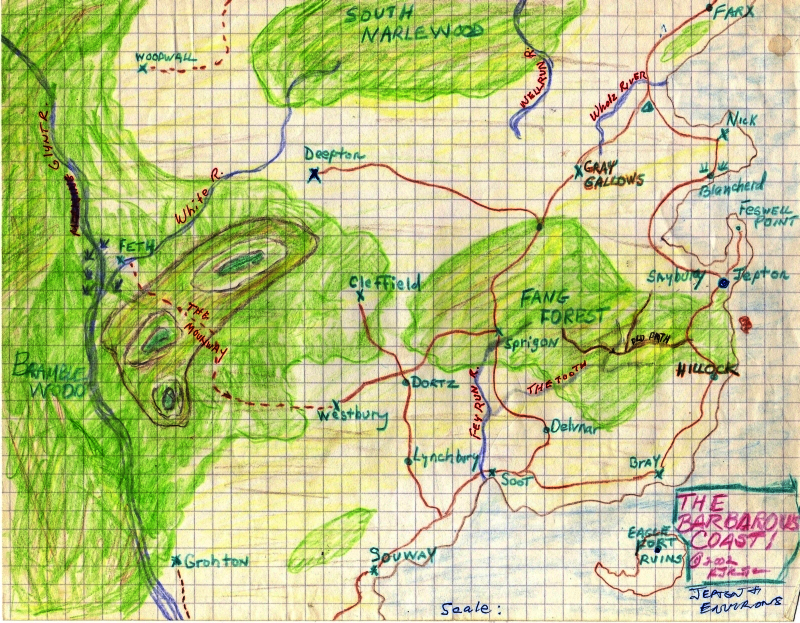 You can piece together the “themes” of specific levels from the map, the accompanying notes and of course off-disk references like Gary’s recollections in Dragon Magazine, Grodog's Greyhawk pages, or the evocative 1975 play report about The Black Reservoir. But those anecdotes about The Great Stone Face, of balrog janitors and men made of gold, those are not in evidence, many of them probably made up on the spot and either never recorded or recorded but lost. “So close, yet so far” is the thought that comes to mind. The most complete level is Bottle City, with a map and a 7-page key (an expanded version of this level was published 2007 by Pied Piper Publishing); there are also interesting parallels with later TSR modules such as The Lost Caverns of Tsojconth (the tournament original). These issues also apply to many of the archive’s smaller adventure scenarios. There is evidence of imagination and craft, particularly when it comes to mapping, but they usually remain tantalising hints. The City of Greyhawk Catacombs & Sewers map is one of the greatest dungeon maps I have seen – Undermountain without the generic feeling – but all we genuinely learn about is this snippet: “This hand drawn map represents a culmination of his efforts, showing the vast, labyrinthine, sometimes cavernous, tunnels, cellars, sewers, and catacombs beneath the city proper. The map links smugglers, cultists, wizards931, lords, thieves, city officials, and all manner of critters and traps to the upper world.” Some other fascinating titles, too – Temple of the Latter Day Old Ones (again, terrific maps, no key), Ruins of Seer (terrific maps, fragments of text), Huhm Jungle (fragmentary intro, overview map), Dungeon of the Mad Wizard Krazor (map sheet, with “Ramshorn Castle Level XV” and “Krazor’s Level Beneath the Outdoor” scribbled on the back), Pirates of the Isle of Ivory (map, two-sheet NPC roster), and so on. Often, you get something that seems to be a mnemonic aid for improvised adventures, or outlines for later expansion. 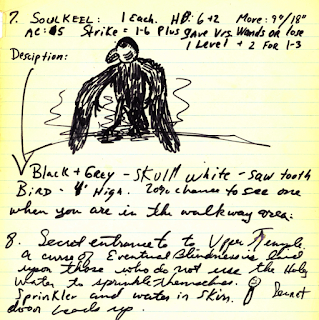 Some documents are the beginnings of products made for publication, and consist of notes which don’t always make much sense, along with a sprinkling of custom monsters/magic/illustrations: The City of Brass, Vale of the Titans, The Lost City of the Elders, or the ultra-high level Pit of Geburah, featuring pregens such as Lemminkainen, Ffahrd and Elric, and inroduced – no kidding! – as “Wow! This is an unfinished tournament module conceived by Rob Kuntz”. A third group of adventures in the archive exist in more or less complete form. These scenarios are not only complete, they also benefit from the most extensive explanatory notes. We have an early form of Dark Druids (which, as T. Foster notes, seems to be completely different from the later published module – it looks like a whole lot of fun, where you can battle the gods and catch a leprechaun). There is The Temple of Reh-Pog, a full 1975 scenario in an ancient earth-god’s underground temple. An early, one-map and two-page-key version of The Stalk, an adventure on giant plants (or with shrunken adventurers). There are others, and they would form the meat and bones of the product if there were more of them – sadly, I’d say these complete documents are in the minority. Then we have an unpublished OD&D supplement: Supplement V: Kalibruhn. This document exists here as a very rough 20-page document, more outline than draft. Much of its materials concern Magic-Users, with things like spell success tables, what looks like a spell point system, alternate spell and magic item tables, and so on. Further traces of a preoccupation with custom magic are scattered in the better hidden corners of the archive – these are minor bits and pieces, but usually worth investigating. Sometimes – as we have seen in some of Rob’s recent modules – things are more complicated than they should be – e.g. Zydilec's Inversion, a ritual spell described over five pages of notes, which seems to do a dozen different things at once. 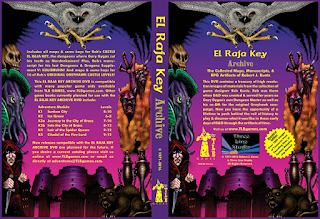 While the El Raja Key Archive is mostly interesting for its adventures, there is also a large amount of world information inside it. I admit to have studied this part very little, although there seems to be an unrealised Kalibruhn world guide in here in multiple pieces – roughly in the style of AD&D-era Greyhawk, with a lot of attention to noble families, creation myths and some country descriptions. Materials for Greyhawk fans include some very early material for the never-published City of Greyhawk (including NPCs, location sketches, or that beautiful sewer map), as well as a few much more recent and great-looking maps for Rob’s never-published Wild Coast (later: Barbarous Coast) project. 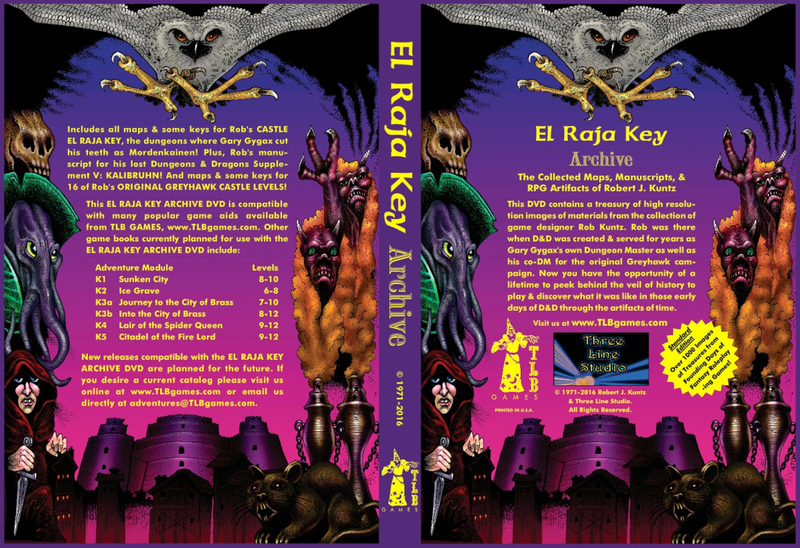 What does the El Raja Key Archive add to our understanding of D&D? It does not provide us with a key to vast treasures, but it gives us some interesting puzzle pieces. 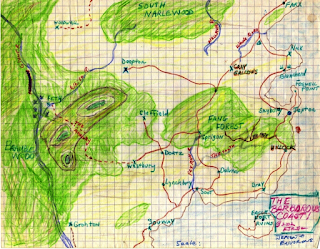 While The First Fantasy Campaign, Wilderlands of High Fantasy, Arduin et al. are interesting for their departures from standard D&D, the archive is interesting because its author was so close to the fire. This is something from the early history of TSR’s D&D, Gary’s D&D, and Rob’s D&D too. It is easy to see why it didn’t remain his D&D for too long, although it would have been interesting to see that – there are slightly different sensibilities to these materials, with a different understanding of magic (a heavier emphasis on elemental realms, rituals and focus items), and different influences with a slight exotic touch. Sources like the 1001 Nights, Clark Ashton Smith and Lovecraft crop up more often, while there seems to be a little less of Vance and Leiber. And of course, just as some of the adventures in the archive have influenced TSR products, there are many more that have never been published, but could have easily became part of the TSR classics. As Sunken City, Bottle City and The Stalk show, there is much that could benefit from a full publication. While the archive is one of a kind, its limitations are also obvious. It would be a winner with expanded document descriptions (less PR, more content), but in its current shape, it tells frustratingly little about itself, and some of the most interesting documents remain incomplete or opaque. The archive will be invaluable to game historians who are ready to go deep and look for the really obscure pieces of inspiration, but for most gamers, it will probably remain a curiosity. Thanks for sharing your thoughts, Melan. Fascinating. Grateful for this review as I no longer have a disc drive in any of my computers or devices! Note that you can also order the archive on a USB stick.